at Comenity Bank's Secure Site. The Bealls Credit Card is one that any fashionable Floridian should make a place for in their wallet. That’s because The Beall’s Credit Card offers generous rewards for loyal Bealls shoppers. You can earn 1 reward point for every $1 you spend either in Bealls stores or online at BeallsFlorida.com. That means you can spend the afternoon shopping with friends, then go online later that night and purchase that pair of earrings you were regretting leaving behind, all while earning Bealls reward points. Bealls reward points add up quickly to save you money. Every 200 reward points offer you a $10 discount that you can apply to your next Bealls purchase. Bealls also occasionally offers exclusive promotions where cardholders can earn double, or even triple points for purchases made both in stores and online. Bealls rewards points are valid for 12 months, so you can use them right away, or save them up. You can use them whenever is most convenient for you. Do you have a loved one’s birthday or special occasion coming up? You can use your Bealls reward points to select the perfect gift, and they will never know that you used a discount. Or save the rewards to splurge on something extra special for yourself. Either way, it’s up to you. Bealls Credit Card loves to reward their most loyal shoppers so if you spend $500 or more in a year, you will automatically get upgraded to a Gold. You don’t have to miss out on all of these benefits if your credit score isn’t ideal. Even if your credit score is only fair, you don’t have to worry about getting approved for The Bealls Credit Card. The Bealls Credit Card does not come with an annual fee, which means that you do not have to pay some of your hard-earned dollars, just for the privilege of using the Bealls Credit Card. You can keep it in your wallet for years to come, and continue to shop, earn rewards, and save. 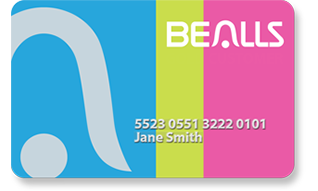 The Bealls credit card offers a consistent APR, which means that you can go shopping whenever you want and not have to worry about being charged more interest at different times. Buy what you want and pay for it later, all while building your credit history, The Bealls credit Card might sound too good to be true, but it isn’t! $10 for every 200 reward points. Spend $500 or more in a year and earn even more benefits. (Get upgraded to Gold). Rewards points valid for 12 Months. Occasional promotions to double or triple points for purchases made in-store or online. The Bealls Florida Credit Card does not offer any Signup Bonus offers.